Today we said "see you next year" to Texas... and it was so sad. Deacon cried when I woke him up to get ready to go to the airport (hey... I didn't feel like getting up either, seeing as though Zac stayed up all night being sick). 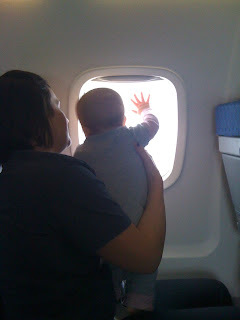 Deacon has NEVER cried about going to an airport... he loves going on airplanes. Poor thing- he was so sad to say goodbye to his cousins. We're all exhausted... and I'm hoping beyond hopes that we all sleep well tonight. Thanks to our Texas family for an amazing visit... we love you guys and miss you so much.